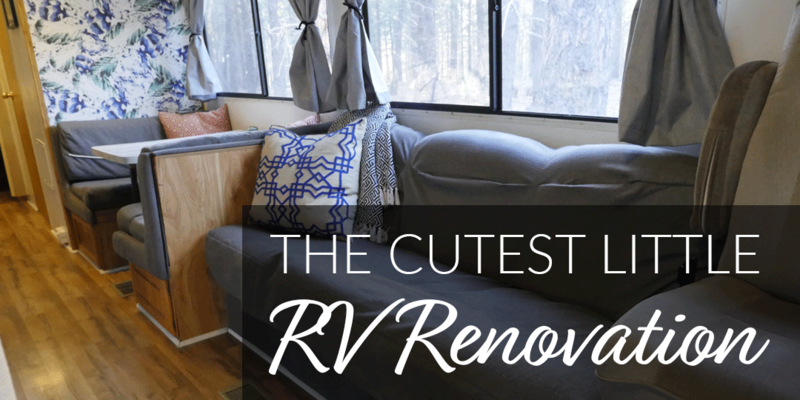 Get ready for the cutest little RV renovation ever… at least in my totally biased opinion. When Luke and I bought this 1994 Fours Winds Class A RV, it was nothing special on the inside. Standard RV wallpaper, wooden cabinets everywhere and lovely pink carpet were all it had to show. 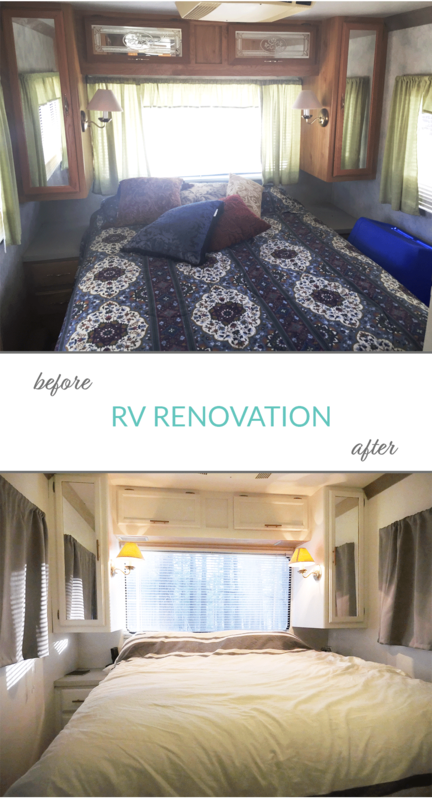 With no plans of full-time RVing at the time, we got to work renovating the RV. Since the original cabinets in the front were ruined, we decided to replace one side with open cabinets. Yes, open cabinets in the RV. Luke built a lip in the front of the cabinet, and we found the perfect sized baskets. Nothing has fallen out, yet! On the other side, we decided not to replace the cabinets and to mount a small TV instead, which we rarely use. Luckily, we didn’t need the extra storage, and it makes it feel more open. TV or no TV, I think we made the right choice. 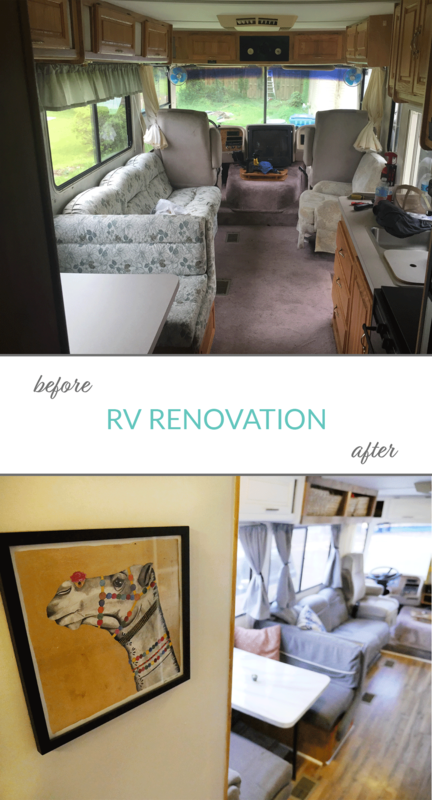 I’m so thankful we decided to do the RV renovation first, so there was one less thing on our to-do list when we decided to RV full-time. Not renovating wasn’t an option. Living in such a small space is much more enjoyable when it looks and feels like home. First things first, we knew the faded pink carpet had to go. We found laminate wood floors at a local discount store for cheap, and since we only need a few boxes to cover whole RV, it worked out great. I knew when we started the RV renovation I wanted to go all white with the walls and the cabinets. 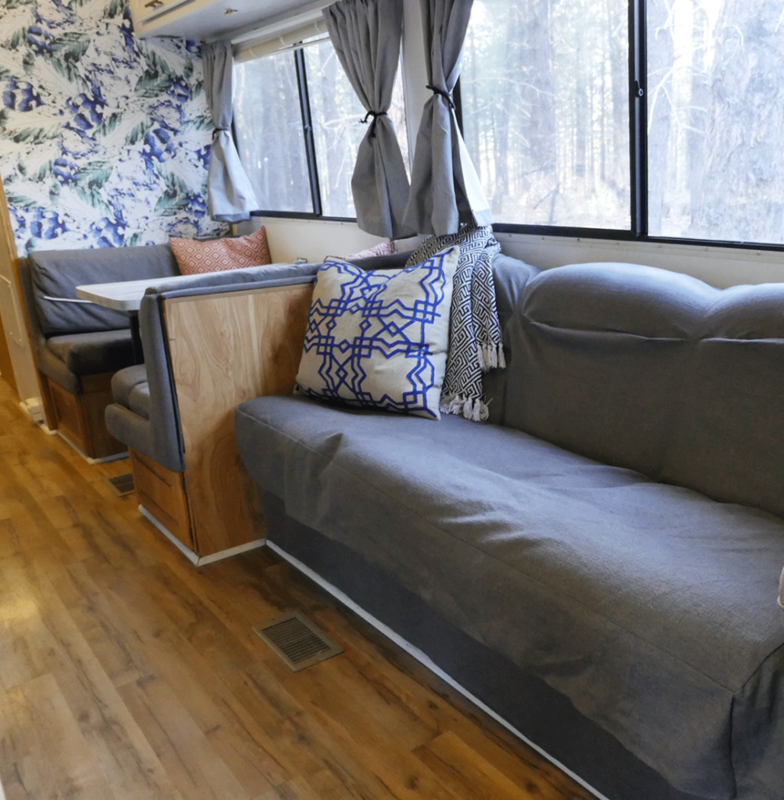 While it requires more daily cleaning than a darker color, it brightens up the RV and makes it feel more open. I did decide however that I wanted to go with a darker color for the lower cabinets in the kitchen to give some contrast. Now that we are full-time RV living with the three dogs, I’m so glad we did. White cabinets on the bottom would have gotten dirty too quickly. I love painting and switching up paint colors at home, but painting the interior of an RV is no joke. Maybe it’s because we did it in the middle of summer, but I have no interest in repainting the RV. The hardware on the cabinets and drawers also needed to be replaced. I had my heart set on gold drawer pulls, but the budget didn’t agree. 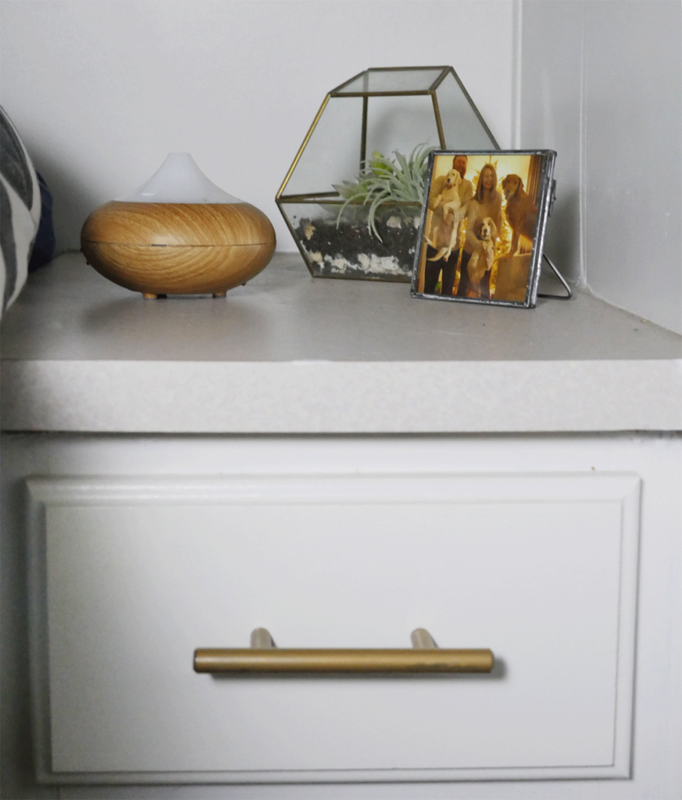 So I found some inexpensive nickel drawer pulls on Amazon and sprayed the gold with Valspar spray paint. I wish I would have put a primer on the drawer pulls first because the gold is starting to wear off. I’ll touch them up after this trip is over. 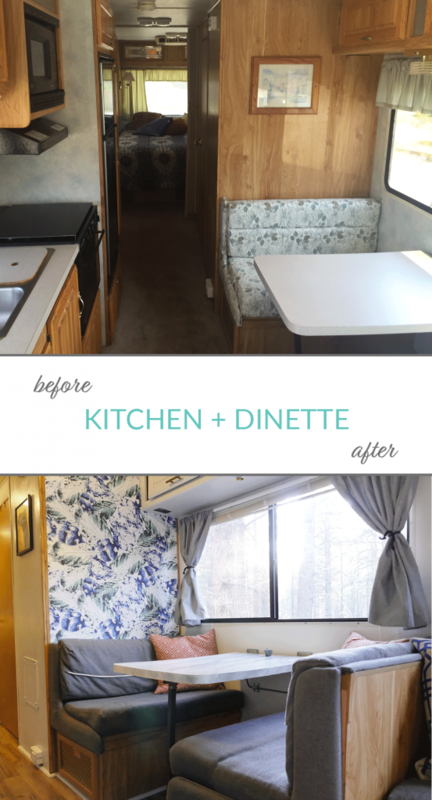 During the whole RV renovation, my main concern was the empty wall behind the dinette. With a primarily white interior, I wanted something with some color and visual interest. I thought about a gallery wall but wasn’t convinced it was the best option for the space. That’s when the 2 month wallpaper search began. I Googled for hours, visited local stores, looked on Pinterest and Etsy and couldn’t make a decision. 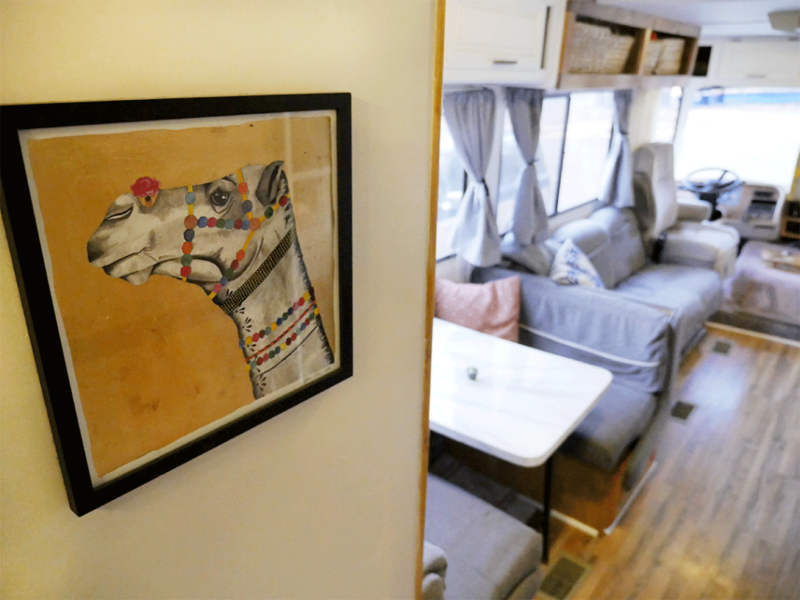 I had two different concepts – white and gold or Jungalow inspired – and knew this little wall would set the tone for the rest of the RV. And remember, at this point, we weren’t even planning on living in the RV full-time… I can’t image how long it would have taken had I known. Hah. Finally, I decided to go with a blue and green palm leaf, feather-inspired removable wallpaper that I found on Etsy. It’s perfect. Just enough color to draw attention but not overpower the rest of the design. With the major things done, I wanted to update the kitchen table and upholstery. 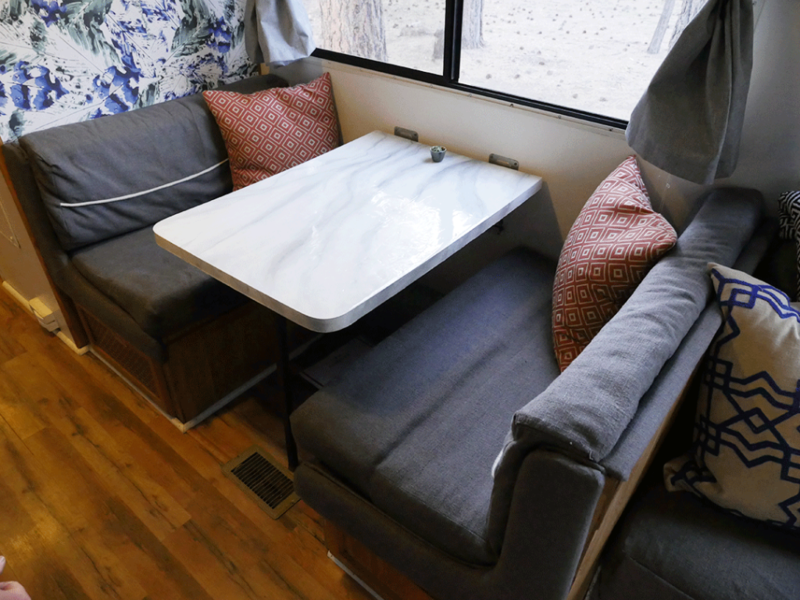 Since RV kitchen tables are more than just tables – aka convertible beds – I knew I couldn’t straight up replace it, so I decided to paint it. 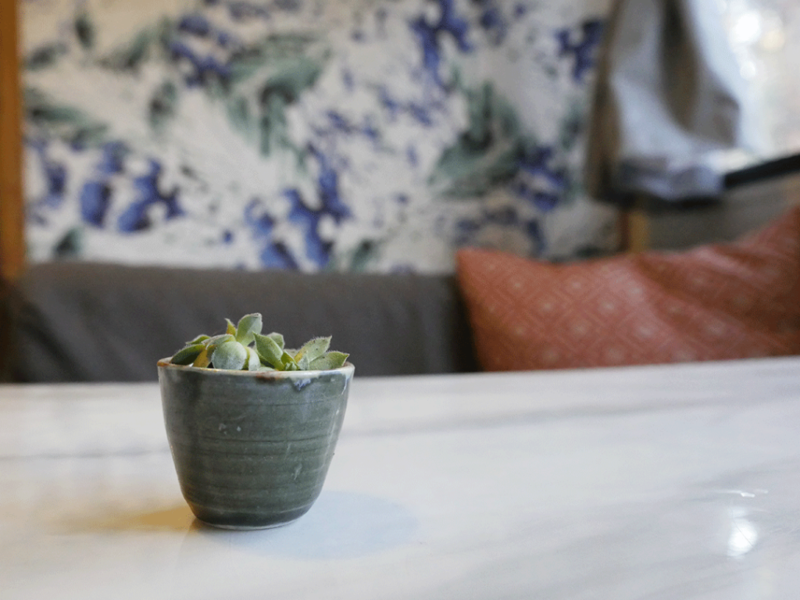 I found a great DIY faux marble painting video online and went with it. I took a few layers of paint, but I’m happy with how it turned out. Since we use the dinette as the kitchen table, home office, extra counter space and hang out there most nights, I’m glad we decided to update it. Deciding what fabric to use to recover the dinette cushions and couch took about as long to decide on as the wallpaper. I originally wanted some sort of print, but it need to compliment the wallpaper and be dog-friendly. I just couldn’t find what I had in mind. I eventually found a plain gray upholstery fabric that I liked. Then the fun really began. I’ve sewn a few things in my day – a few pillows, a simple quilt and a skirt, but nothing like this. Using the original covers and brown craft paper, I made a pattern for each section. Then, I slowly started sewing the pieces together, stopping to make sure I was going in the right order. It took forever, but I only had to take out one small section of stitches. Success! I snagged a few accent pillows from the house, since we didn’t need them in there anymore, and wa-lah! It all came together. Being the girl who redecorates everything and will spend hours walking around the home section of Anthropologie, I knew we had to keep the décor simple and clean. In the main part of the RV, we have a mini-succulent and the throw blanket. The hallway features this guy. I have a zebra print to accompany him, but I broke the frame about a week into the trip. 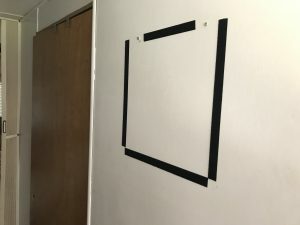 The best way I’ve found to hang pictures in the RV is to use a small nail and frame hook, and then do a border of Velcro along the back of the fame and wall. That camel hasn’t moved a bit. In our room, we went with a white bedspread and a few minimal decorations on the nightstand. We’ve found industrial double-stick tape works best to keep everything secure when driving. This is our home from front to back. There’s still a few little projects (with plants) I want to do when we have time, but all-in-all we are excited with the end result. Let us know in the comments if you have questions about our renovation or any RV renovation plans you are working on. We’d love to help! Loved you website! We camp host for months at a time, but I wasn’t convinced to take the leap into full timing. We have 2 labs and a 25 foot camper, you have definitely peaked my interest. This is seriously amazing! I never would have thought an RV could be so pretty! This makes me try this way too. I love any informative articles regarding vintage campers; all these things mentioned are all true and so helpful. I like that you pointed out the water damage issue. RV liquid roof coatings is a must have material for all DIY vintage campers renovations project to avoid future water damages.